PITTSFIELD-Anyone who chooses to enter The Death Race at youmaydie.com and clicks the “I May Die” link accepting all conditions on the waiver is assumed to be masochistic if not downright insane. The “race” is completely undefined. There is no given end time, number of tasks or restrictions on what competitors might be asked to do. Racers sign up knowing only that they will be pushed to their breaking points in a test of physical strength and mental stamina. 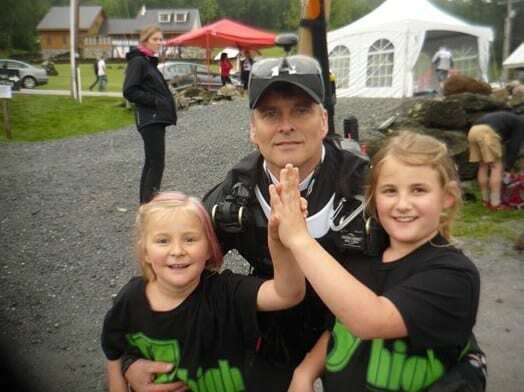 Robin Crossman, a life-long Vermonter who resides in Chittenden, will enter his third Death Race this Friday, June 15, in Pittsfield. He has finished both past races and holds the record for the oldest finisher at 54. “I’m the oldest one to finish ever. I’m going to be 55 this year. I’m trying to stay with the record,” he says. About 300 racers are expected to turn out for this year’s Death Race; a record number. In past races, only about 10% finish. Many go home frustrated and some very mad. But that can fuel motivation, Crossman says. “I know people who dropped out last year and within an hour regretted it. They regretted it for a year and are now back,” he says. If past tasks are any indication of what these racers are to expect this year, it’s not much help as they are varied and unpredictable. The first challenge last year started with 13 groups of 13 people. There was a 60 lb. rock, PCB tube full of water, a hay bail and another rock, Crossman explained. Each person had to lift the rock to their chest with a pack on, set it down, and then move to the left to lift the next object. “We did 106 revolutions for about 5 hours,” Crossman said. “Only two people dropped out and the race officials were very mad.” Crossman dropped a rock on his foot during this challenge. He went through the rest of the race with a broken foot. “You just keep going… Injuries are part of it,” he says. Another challenge consisted of competitors pulling themselves through 50 degree water at 1 a.m. After crossing the river and climbing a steep embankment, competitors were given a candle. Cold and wet, they had to walk around a field keeping it lit. “You’re cold, you’re shaking, you don’t want to breathe on it, and if it goes out you have to go back and get another until you can make it all the way around and hand it back lit,” Crossman said. “It’s one thing to be cold, it’s another thing to be wet or tired, but when you’re cold, wet and tired all at once for a long period of time, it wears on you,” he says. Like most of the Death Race competitors, Crossman is a veteran athlete. He completed over a half dozen ironmans, several marathons and a 3-day triathlon event, before he entered the Death Race. “Those events are all physically challenging, but they’re also predictable,” he says. which make them much easier to train for. Most people come thinking they are prepared, but they’re not, he says. It always comes down to is what’s inside more than what equipment racers bring or what physical shape they’re in, he continued. “I saw people crying on the course last year. It just breaks you down…There are people in this race from the armed forces, from the Special Forces, and top athletes from around the world and some of them don’t finish,” he said. Crossman is also among the “barefoot” runners. He recently completed the Peak 50 mile race in his “five fingers” (the shoes with individual toes.) He attributes his preference to jumping rope barefoot as a kid. To this day he jumps rope barefoot and can do it for over an hour! Throughout the whole race contenders keep moving, they don’t sleep for days. Crossman has six children, ages 6, 8, 10, 12, 19 and 22 years old. Race day “is a family event,” he adds. The kids play with their friends at some of the stations; his wife, Melissa, volunteers, and many other family members make up his support team. Every year racers are told just two things to prepare them for the race: the theme of the race and a list of stuff to bring. This year the theme is Betrayal. “My first year it was Money Management and we had to carry $50 in pennies, that’s 27 pounds, in our packs,” he said. “The race starts when you sign up, people don’t realize that,” Crossman says. “There are a lot of folks trying to figure this race out. I try to just sit back and not look at the list until the day before because it’s going to change a million times,” he says explaining that this is also part of the game, part of the frustration. Odd items appear on the list, one day it’s a bonsai tree, the next a goldfish, then dress shoes, and knitting needles, says Crossman. “The goldfish was on the list for a long time last year,” he said. “I spent a long time trying to figure out how I was going to keep my goldfish alive through the race.” It didn’t make the final list, which was lucky because, rumor has it, they were going to put them all in a 100 gallon aquarium and make racers identify theirs at the end. “I wouldn’t put it past them to do anything, they want you to be unprepared… they want to through you off balance,” he said. In addition to the items on the list, there is no limit on what you can bring, but what you start with you have to end with. “You can bring a canoe if you want but you have to have it with you at all times,” Crossman said. Finding an individual’s breaking point is the heart of the challenge. When race officials find it, it’s up to the contender to move through it. The goal is to finish, but the focus must be the task at hand, one by one and on to the next. So what’s the secret to finishing a Death Race? Does Crossman really have an aversion to warm water? No, but if the race organizers don’t read this far, he may get lucky and face warm water on a challenge instead of bitter cold. It’s all the help I can give. Good luck, Crossman!